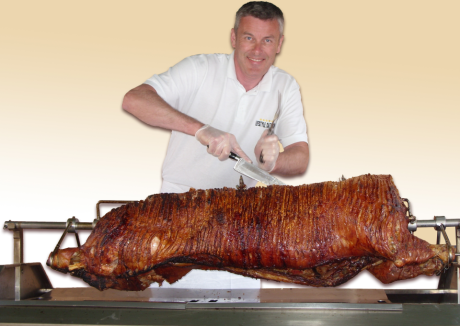 Here at Lifestyle Catering, we are proud of the fantastic reputation that our ever popular Hog Roast has earned over the years. Whether your event is formal or casual, business or pleasure, why not try dining with a difference? Free Range Organic Hog Roast; A popular choice, this tender, succulent locally reared pig remains a firm favourite amongst our returning pork lovers! Mallorcan Black Organic Hog Roast; This temptingly tasty pig is the number one choice of the Mallorquin locals and is a pleasingly plump and popular all round winner. Iberico Hog Roast; This top-of-the-range pig is unsurpassed in its class for its divine rich, deep flavour making it the outstanding choice for the pork aficionado! All our hog Roast menus are served with complimentary; freshly baked soft bread rolls apple sauce and traditional sage and onion stuffing. We also offer an optional range of crunchy, freshly prepared salads, a variety of delicious potato options and locally sourced grilled vegetables. To make your event a truly memorable occasion, why not take advantage of our optional bar service, D.J and music package too? We can also suggest venues and arrange transport for your guests if required. We are experts in tailor-made event planning, so why not contact us today with your requirements?